"Patented waterproof watch - Antishock device - Unbreakable crystal". 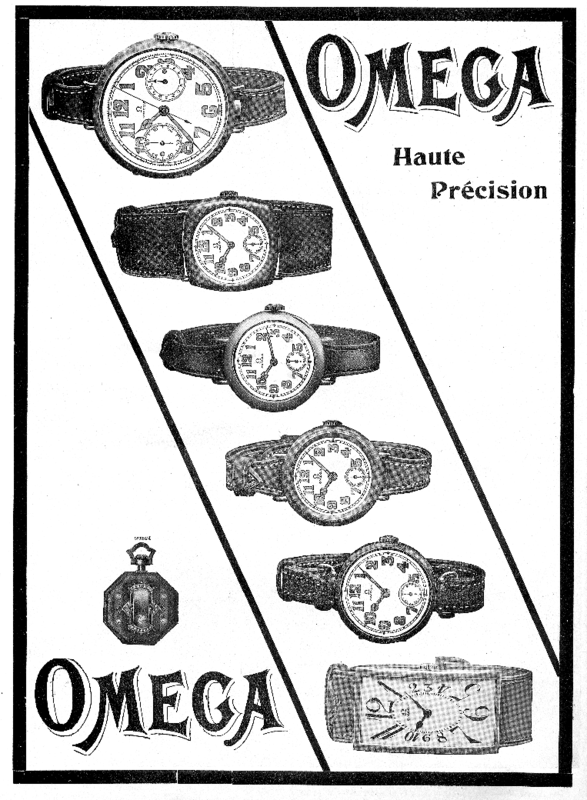 This ad dating back to 1939 hints to more than just all-weather timepieces. The military-looking aircraft seen on the background is a reminder of the difficult times ahead, as Europe is on the verge of war. The chronograph on the left is equipped with the caliber 13ZN. The watch on the right looks very much like a number of timepieces supplied to the armies. Do you like vintage watch ads? Please visit the page about Watch Ads, my two-volume pictorial history of communication and design in 20th Century watchmaking. Click here to watch the video clip about Watch Ads. Click here to display and download a 20-page preview of Volume 1. "Orologio impermeabile brevettato - Dispositivo antiurti - vetro infrangibile". Questo annuncio del 1939 non allude solo a orologi in grado di affrontare le intemperie. L'aereo di aspetto militare sullo sfondo ricorda che l'Europa sta vivendo tempi difficili ed è sull'orlo della guerra. Il cronografo sulla sinistra è equipaggiato con il calibro 13ZN. L'esemplare sulla destra è molto simile a quelli forniti a numerosi eserciti. Ti piacciono le pubblicità d'epoca? Visita la pagina su Watch Ads, la mia storia illustrata in due volumi della comunicazione e del design nell'orologeria del Novecento. Clicca qui per guardare il video su Watch Books. Clicca qui per visualizzare e scaricare un'anteprima di 20 pagine del Volume 1. Stefano Zorzan ha vinto la quarta tappa del campionato Watch Is It identificando il fabbricante di questo esemplare degli Anni 40. Ecco i dettagli storici e tecnici. 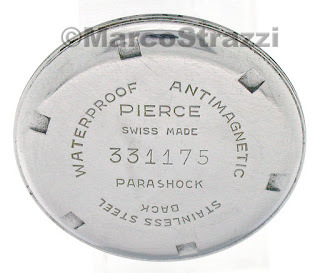 Passarono sette anni prima che Pierce riuscisse a industrializzare e a lanciare il suo brevetto del 1933 per un orologio automatico. La modalità di funzionamento ricordava il Rolls e il Wig-Wag, benchè a muoversi avanti e indietro sopra il movimento fosse un peso e non il movimento intero. La ricarica avveniva tramite un'asticella dentata fissata alla massa oscillante. Quest'ultimo tentativo di orologio automatico a rullo era condannato all'insuccesso fin dall'inizio perché le sue prestazioni non potevano reggere il confronto con i modelli contemporanei a martello o a rotore. Inoltre, la prima versione era priva della funzione di carica manuale, che fu aggiunta nel 1945 insieme con la lancetta centrale dei secondi. 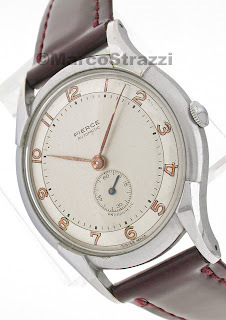 Malgrado i suoi limiti, il Pierce Automatic rimase sul mercato fino al 1954. Misure Diametro 36 mm, spessore 9 mm. Cassa Acciaio, fondo chiuso a vite. 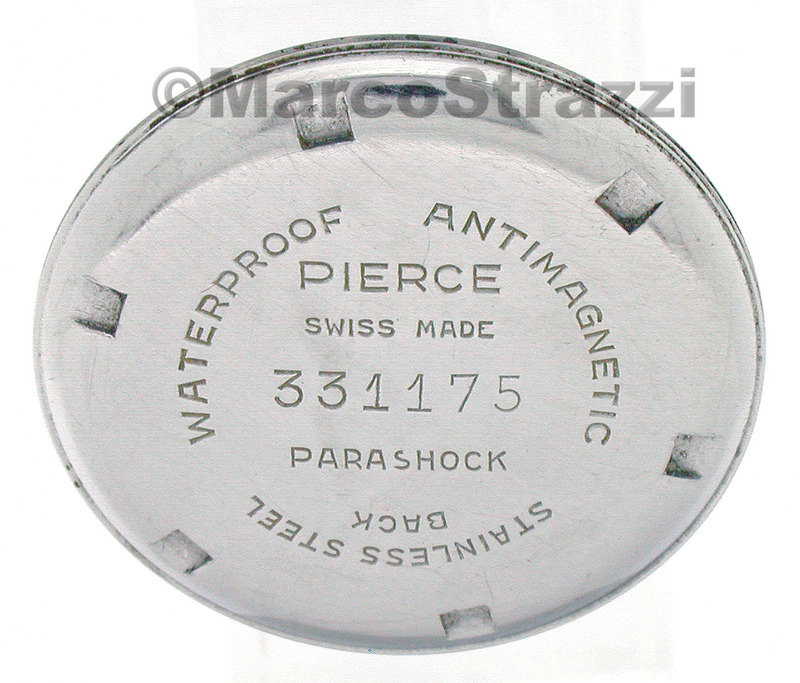 Movimento Calibro 861, carica automatica, diametro 28 mm, spessore 5,1 mm, 17 rubini, bilanciere monometallico a viti, spirale piana, dispositivo antiurto Incabloc, 18.000 alternanze/ora. PARTECIPA A WATCH IS IT. NON COSTA NULLA E PUOI VINCERE UNO SPLENDIDO OROLOGIO! Classifica dopo la 4. giornata: F. Vanni p. 11; S. Zorzan 8; D. Martelli p. 4; M. Giannattasio 1. Stefano Zorzan won the fourth stage of the Watch Is It contest by identifying the manufacturer of this timepiece of the 1940s. Here are a few historical and technical infos. It took seven years to Pierce to industrialize its 1933 patent for a self-winding movement. 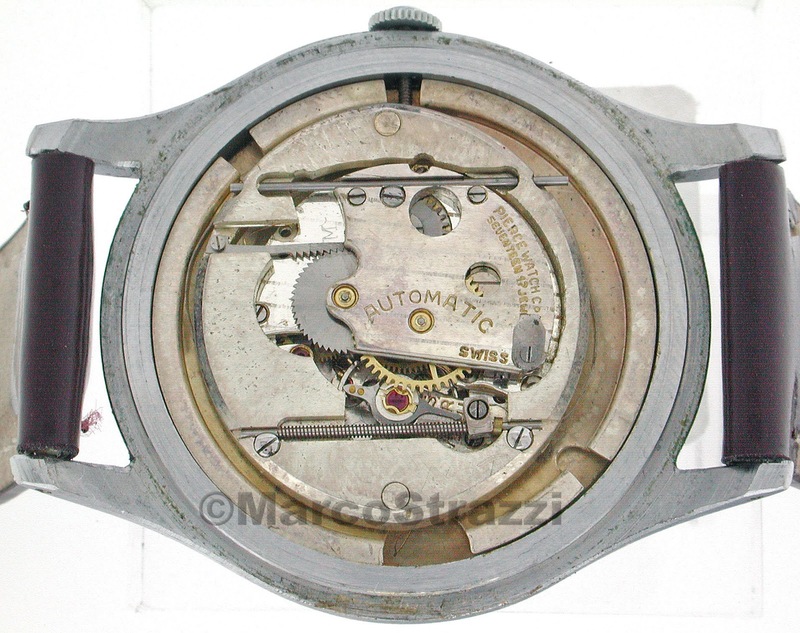 Its operation mode reminded of the Rolls and Wig-Wag automatics of the early 1930s, though a sliding weight moved back and forth over the basic movement, rather than the whole movement. The one direction winding took place by means of a toothed rod that was attached to the swinging mass. This final attempt at a roller automatic was doomed from the start, as its performance could not stand the comparison with the contemporary hammer and rotor models. On top of that, the earliest version did not feature a hand-winding function, that was only added in 1945, along with a sweep second hand. 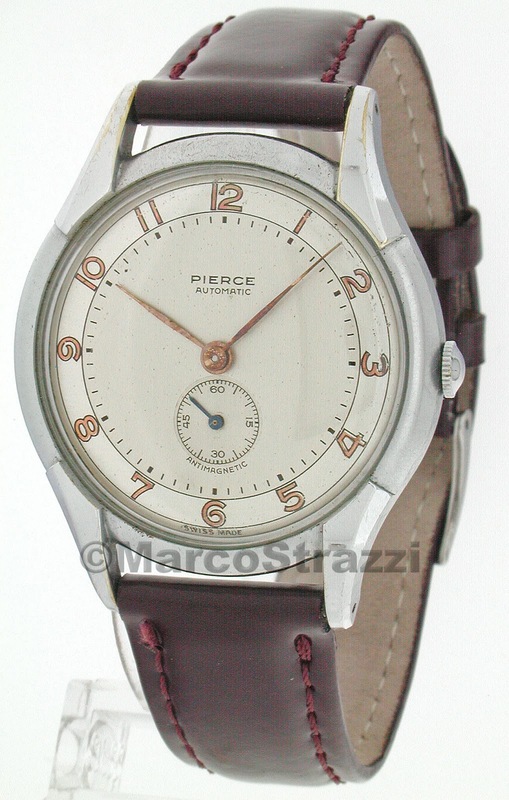 In spite of its shortcomings, the Pierce Automatic was only discontinued in 1954. Size Diameter 36 mm, thickness 9 mm. Case Stainless steel, screw-down back. 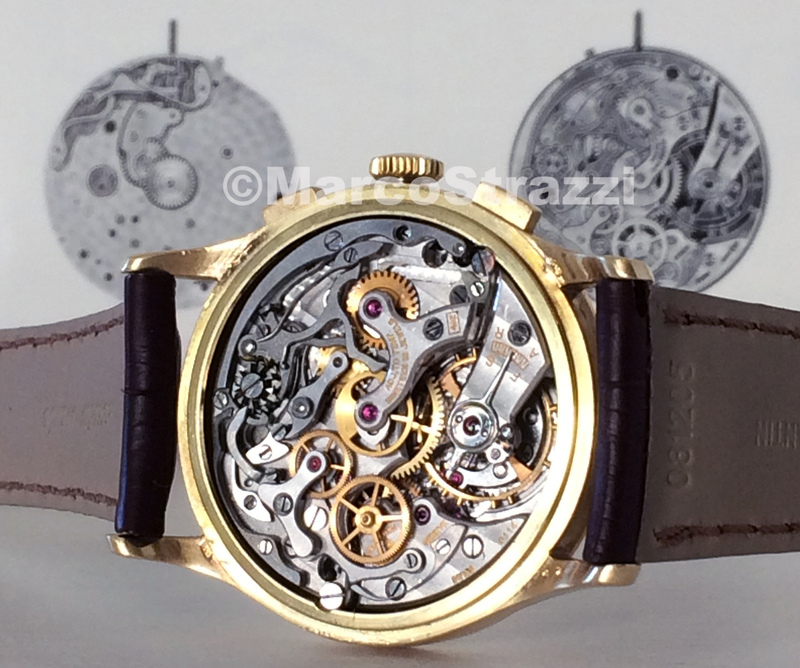 Movement Caliber 861, self-winding, diameter 28 mm, thickness 5.1 mm, 17 jewels, monometallic screw balance, flat hairspring, Incabloc shock-absorber, 18,000 vibrations per hour. 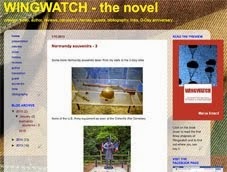 TAKE PART IN THE WATCH IS IT CONTEST. IT IS FREE AND YOU CAN WIN A BEAUTIFUL WATCH! Ranking after Day 4: F. Vanni p. 11; S. Zorzan 8; D. Martelli p. 4; M. Giannattasio 1. Il primo video del Canale YouTube di 10e10.ch è dedicato a un subacqueo molto attraente e significativo degli Anni 60. Buona visione! The first video clip of the 10e10.ch YouTube channel features a very fine and interesting diver's watch of the 1960s. Enjoy! "High precision". 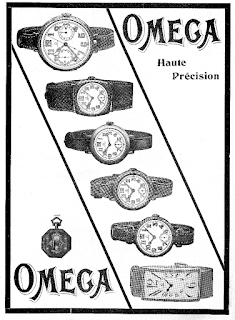 Dating back to 1917, this ad reminds us that Omega was among the earliest manufacturers to feature a wrist chronograph in their catalog. The Bienne brand introduced its first such timepiece in 1913, by soldering wire lugs to the silver case of a pocket chronograph equipped with a 18 ligne in-house movement. In 1915, the model featured on top of this ad was introduced - the ref. 568.18 with the same Caliber 18''' SOPB CHRO. The push piece for starting, stopping and resetting is located at the six o'clock position. 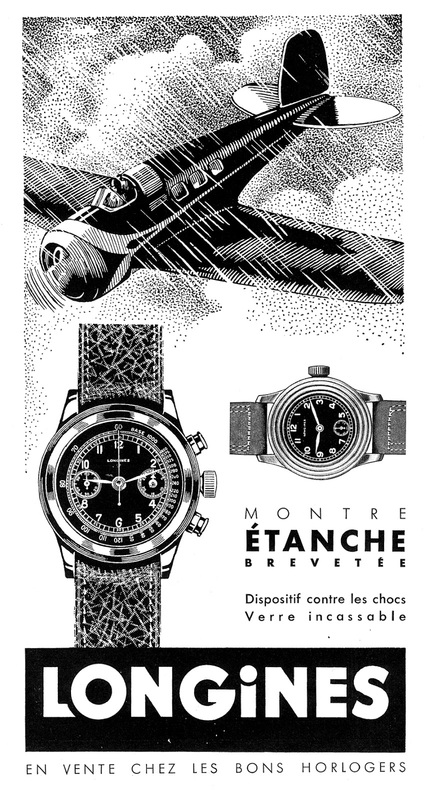 Please note that the vintage ads presented in this Blog are not featured in the Watch Ads books. "Alta precisione". Questo annuncio del 1917 ci ricorda che Omega fu tra i primi fabbricanti a inserire un cronografo da polso nel proprio catalogo. La Casa di Bienne lanciò il primo nel 1913, saldando due anse a filo sulla cassa d'argento di un cronografo da tasca equipaggiato con un movimento da 18 linee. 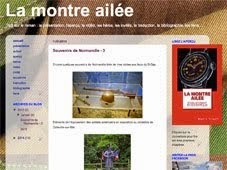 Nel 1915 nacque il modello visibile in alto nella pagina: la ref. 568.18 con lo stesso calibro 18''' SOPB CHRO. Il pulsante per l'avvio, l'arresto e il ritorno a zero si trova a ore 6. Gli annunci pubblicitari d'epoca presentati in questo Blog non sono inseriti nei volumi Watch Ads. Nessuno è riuscito a identificare il fabbricante di questo orologio e a vincere la terza tappa del campionato Watch Is It. Ecco i dettagli storici e tecnici sull'oggetto misterioso di oggi. Questo esemplare risale ai primi Anni 30. L'elaborata cassa d'oro bianco e il movimento di qualità superiore, provvisto di tre regolazioni, dimostrano che si tratta di un prodotto di gamma alta. 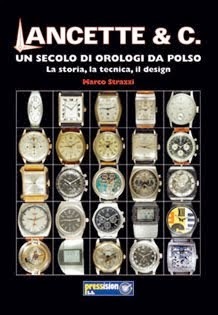 All'epoca della sua fabbricazione, il marchio Doxa era molto noto agli appassionati di orologi. I suoi annunci pubblicitari apparivano con frequenza sulle riviste e sui giornali, accompagnati da slogan in cui la compagnia sottolineava la modernità dei propri orologi sia dal punto di vista tecnico sia estetico. Misure 37 x 22 mm, spessore 7 mm. Cassa Oro bianco 18k, fondo chiuso a pressione. Movimento Calibro 899, carica manuale, diametro 19,75 mm, 17 rubini, bilanciere bimetallico tagliato, spirale piana, 3 regolazioni, 18.000 alternanze/ora. Classifica dopo la 3. giornata: F. Vanni p. 11; D. Martelli 4. No one could identify the manufacturer of this timepiece and win the third stage of the Watch Is It contest. Here are a few historical and technical infos about today's mystery watch. This watch dates back to the early 1930s. The elaborate design of its white gold case and the quality of the movement - provided with three adjustments - suggest that it was a high-end timepiece. 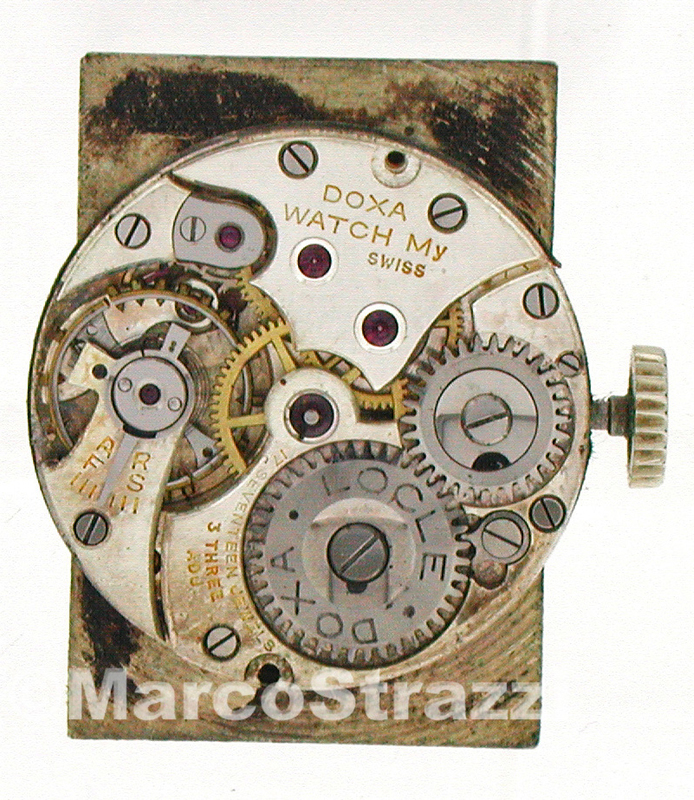 At the time of its production, Doxa was a familiar brand for watch lovers everywhere. 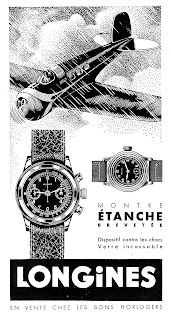 Its ads frequently appeared on papers and magazines, along with slogans claiming that the company manufactured state-of-the-art watches both from a technical and aesthetic point ov view. Size 37 x 22 mm, thickness 7 mm. Case 18k white gold, snap-on back. Movement Caliber 899, manual winding, diameter 19.75 mm, 17 jewels, cut bimetallic balance, flat hairspring, 3 adjustments, 18,000 vibrations per hour. Ranking after Day 3: F. Vanni p. 11; D. Martelli 4. The ref. 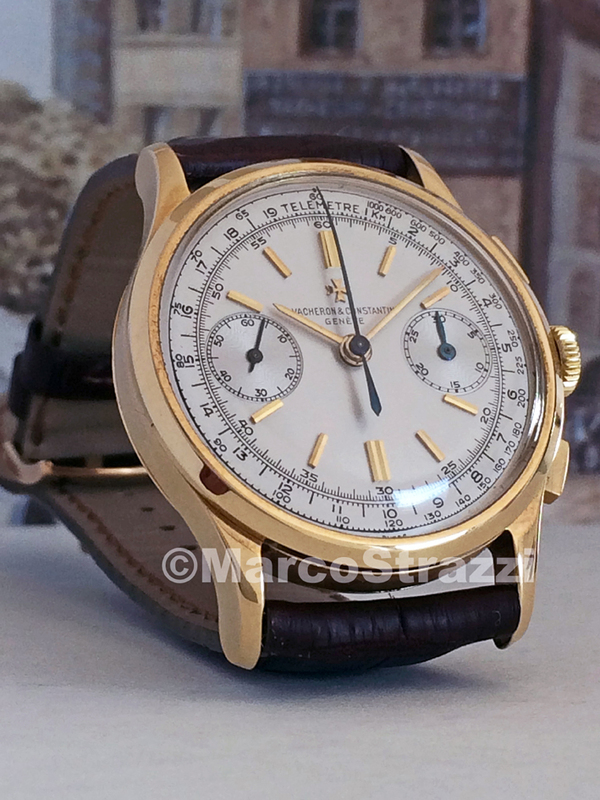 4072 chronograph was one of the longest-lived models by Vacheron & Constantin, its production having lasted from 1938 to the early 1970s. The output during these more than three decades totalled 1'178 pieces made in six case versions - yellow gold, rose gold, white gold, steel, steel with yellow or gold bezel. 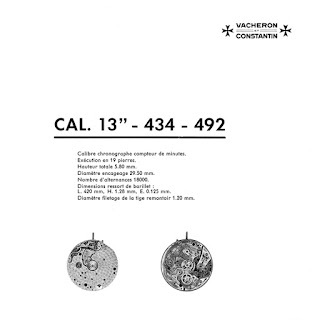 Two versions of the same movement were used - Calibers 434 and 492, both based on the Valjoux 22 and finished according to the high-end standards typical of the brand. The latter include the bevelled angles of the bridges and levers, the straight graining of the levers flat surfaces, the polishing of screw-heads and countersinks, the Geneva stripes on the bridges, the circular graining on the main plate. Finished in mirror polish, the bezel is mostly bevelled, flat bezels being less frequently seen. The sides are brushed, whilst the top and lugs are polished. The pushers can be rectangular or - rarely - oval. 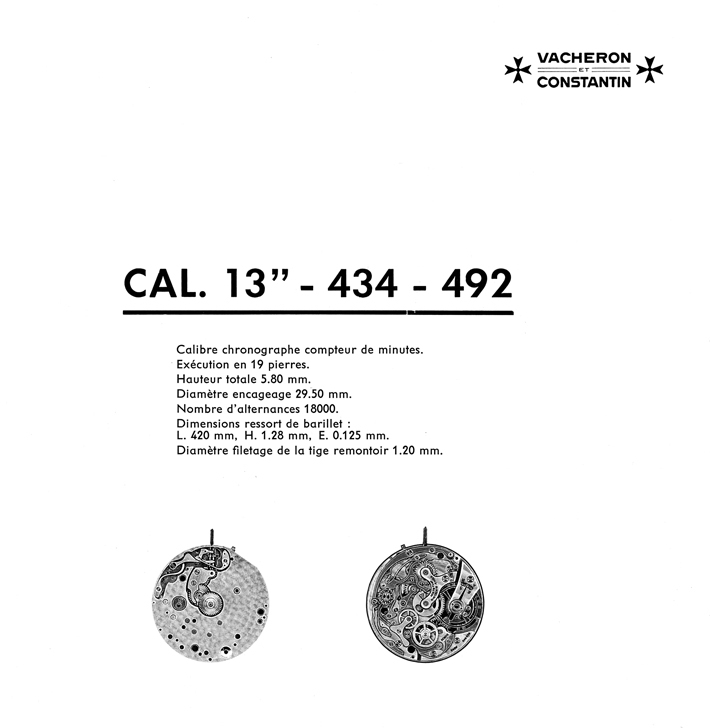 The dial is found in a number of versions, featuring black printed markers and indexes or applied indexes in gold, and different scales (tachometric, telemetric, pulsometric, etc.). The illustrated example dates back to 1963 and is one of the 214 pieces made in yellow gold and fitted with the Caliber 492. Its dial features a telemetric scale, gold baton hands for the hours and minutes, and blued steel hands for the seconds and chronograph functions. 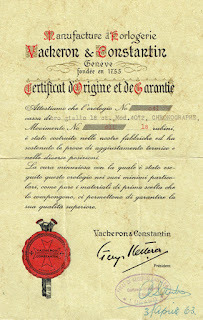 Its original certificate is incorrect in that it mentions 18 jewels rather than 19. It is signed by Georges Ketterer, the then-CEO of the company and a prominent figure of Swiss watchmaking for thirty years. 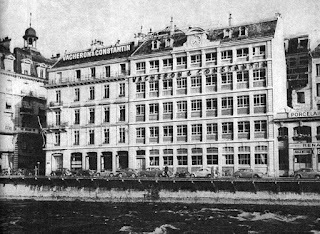 He was the commercial director of Jaeger-LeCoultre when the latter took over Vacheron & Constantin in 1938. He went on to join the board of directors of the Geneva company and purchased a majority stake shortly thereafter. In 1965, he put an end to the partnership with Jaeger-LeCoultre. When he died in 1969, his son Jacques was his successor. The page taken from the 1945 catalog features the ref. 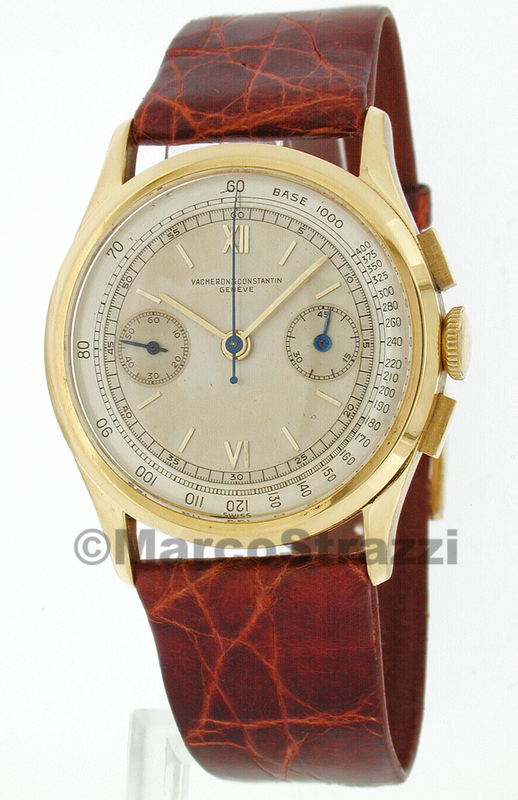 4072 chronograph along with the other complicated timepieces manufactured by Vacheron & Constantin at the time: a pocket chronograph, the ref. 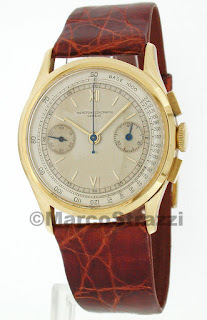 4178 wrist chronograph with tear lugs, the ref. 4240 full calendar and the extremely rare minute repeater. The 4072 in yellow gold was listed at 1,045 Swiss francs. Interestingly, the newly launched Datejust by Rolex cost more or less the same - 1,025 Swiss francs. Functions Hours, minutes, seconds, chronograph with minute register. Case 18kt yellow gold, snap-on back. Size Diameter 34 mm, thickness 9 mm. 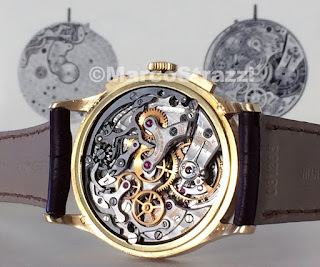 Movement Caliber 492, manual winding, diameter 29.5 mm, thickness 5.8 mm, 19 jewels, monometallic screw balance, Breguet hairspring, adjusted to temperatures, 18,000 vibrations per hour. Il cronografo ref. 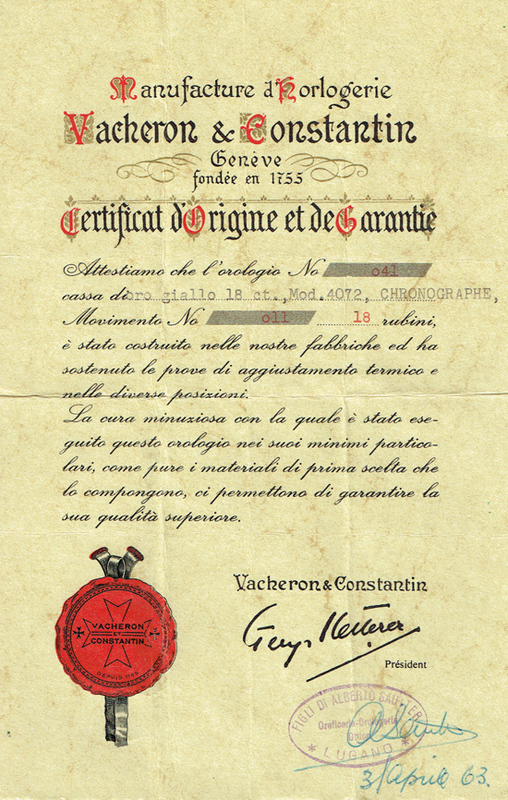 4072 è uno dei modelli più longevi di Vacheron & Constantin, con una permanenza in catalogo che durò dal 1938 ai primi Anni 70. In questo periodo di oltre tre decenni, la manifattura ne produsse 1.178 pezzi suddivisi in sei varianti di cassa: oro giallo, oro rosa, oro bianco, acciaio, acciaio con lunetta d'oro giallo o rosa. Furono utilizzate due versioni dello stesso movimento: i Calibri 434 e 492, elaborazioni del Calibro Valjoux 22 rifinite secondo gli standard dell'alta orologeria. Fra gli interventi figurano i margini dei ponti e delle leve smussati, le superfici delle leve satinate, le teste delle viti e i margini dei fori lucidati, le Côtes de Genève sui ponti, la perlatura della platina. La lunetta, lucidata a specchio, è per lo più inclinata; i modelli con lunetta piatta sono rari. I lati sono satinati, mentre le parti superiore e inferiore delle anse sono lucide. I pulsanti possono essere rettangolari o, raramente, ovali. Il quadrante esiste in numerose varianti con indici neri stampati o d'oro applicati e diverse scale (tachimetrica, telemetrica, pulsometrica, ecc.). L'esemplare illustrato risale al 1963 ed è uno dei 214 d'oro giallo con Calibro 492. Sul quadrante appare la scala telemetrica, le lancette sono d'oro a bastone (ore e minuti) e d'acciaio azzurrato (secondi e finzioni cronografiche). Il certificato originale contiene un'inesattezza nel numero dei rubini: ne sono indicati 18 invece di 19. È firmato da Georges Ketterer, allora presidente della società e figura di spicco dell'orologeria svizzera per un trentennio. 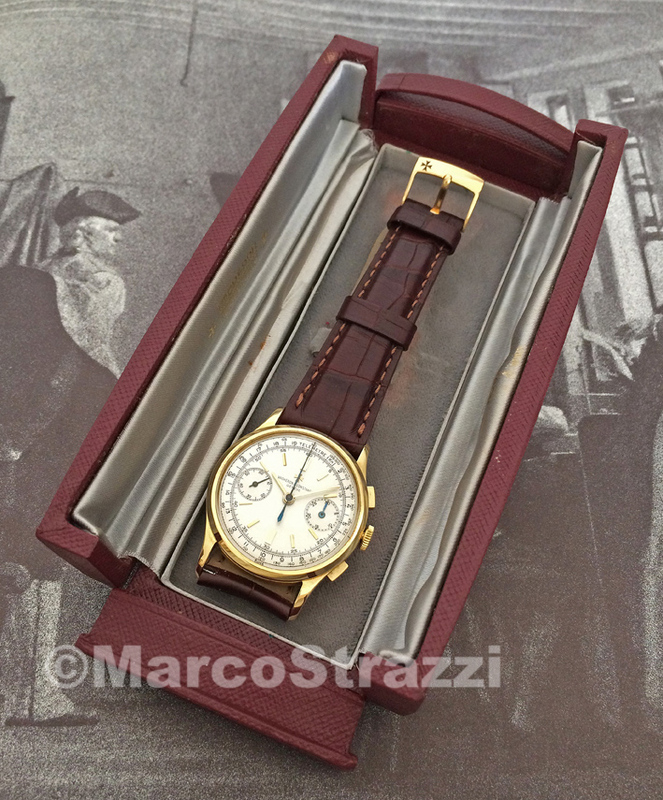 Era il direttore commerciale di Jaeger-LeCoultre quando quest'ultima, nel 1938, rilevò Vacheron & Constantin. Poco dopo, entrò nel consiglio d'amministrazione della Casa ginevrina e ne divenne azionista di maggioranza. Nel 1965, mise fine al partenariato con Jaeger-LeCoultre. Alla sua morte, nel 1969, il successore fu il figlio Jacques. 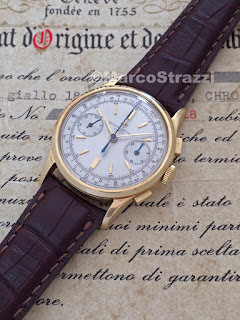 La pagina tratta dal catalogo del 1945 mostra il 4072 insieme con gli altri orologi complicati prodotti da Vacheron & Constantin in quel periodo: un cronografo da tasca, il cronografo 4178 con anse a goccia, il calendario completo 4240 e il rarissimo ripetizione minuti da polso. Il prezzo del 4072 in oro giallo era di 1.045 Franchi svizzeri. 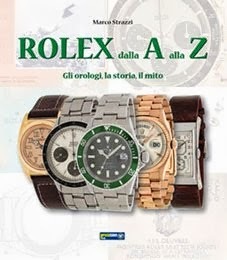 Il neonato Datejust di Rolex costava più o meno la stessa cifra: 1.025 Franchi svizzeri. Funzioni Ore, minuti, secondi, cronografo con contatore dei minuti. Dimensioni Diametro 34 mm, spessore 9 mm. Cassa Oro giallo 18k, fondo chiuso a pressione. Movimento Calibro 492, carica manuale, diametro 29,5 mm, spessore 5,8 mm, 19 rubini, bilanciere monometallico, spirale Breguet, regolato alle temperature, 18.000 alternanze/ora. L'indomito Carles Puidgemont, eroe in esilio della secessione catalana, ha messo la cose in chiaro fin dal suo arrivo a Bruxelles: il suo appartamento dovrà essere indipendente dal resto del condominio. Secondo uno studioso modenese di Nostradamus, tra le Centurie si nasconderebbe l'ennesima verità sconvolgente che nessuno ha mai voluto riconoscere e divulgare prima d'ora: Vettel è una pippa. Duramente attaccati per il ritratto di Anna Frank con la maglia della Roma, i leader del tifo laziale chiariscono che si tratta di un equivoco: "Il nostro delegato agli affari culturali pensava che fosse una foto di Sabrina Ferilli da giovane". Ad occhio e croce, l'unico evento che l'ISIS non ha (ancora) rivendicato è il Diluvio Universale.